If you haven’t heard yet, there’s a new place to connect with the prevention community from across the globe and it’s an exclusive benefit, just for CADCA members. Members like Virgil Boysaw are taking full advantage of this new benefit to further the success of the prevention field. 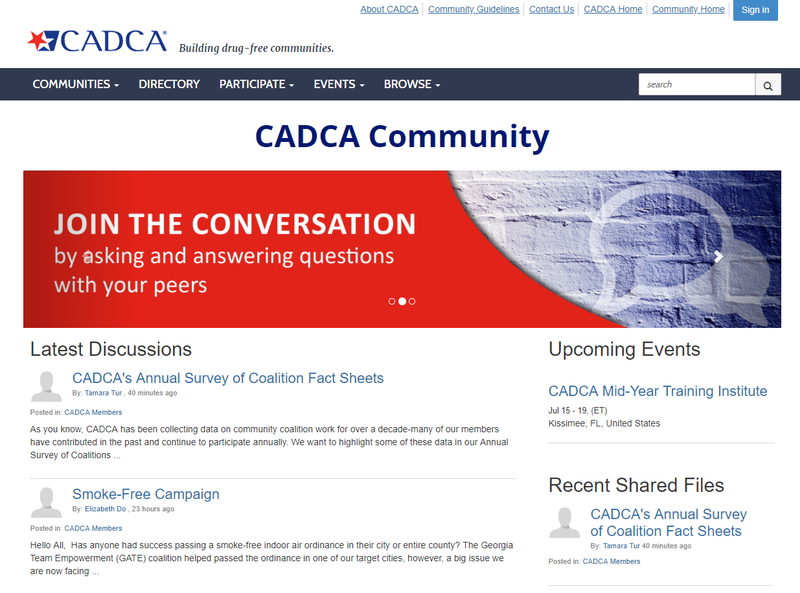 Go to community.cadca.org to start a new discussion with your peers, read highlights from past discussions and browse the resource library. Nothing can replace the in-person conversations that happen at the National Leadership Forum, Mid-Year Training and other CADCA trainings, but the CADCA Community can help you learn from members instantly. Members who are not able to travel to CADCA trainings have a new way to gain value by network with their peers online. One of my favorite aspects of the CADCA Community is seeing how members are networking from across the country. For example, members from South Carolina, Rhode Island, Kansas, and Louisiana all shared their Sticker Shock campaigns and experiences. You can network on this new platform whether you are an urban or rural coalition, focused on alcohol or opioids, well-established or just starting out. This combination of in-person trainings and the CADCA Community ensures every member has access to all of CADCA’s networking opportunities. Coalition leaders and prevention professionals are extremely busy. Here at CADCA, we know you all hold meetings in the evenings and do a lot of work on the weekend. The CADCA Community is here for you 365 days a year. You can log in anytime to search for resources, ask questions and network. It’s very user friendly and we have a great mobile version so you can access the CADCA community anywhere, anytime. The CADCA Community has already given CADCA members access to over 30 new resources shared this past month. Don’t recreate the wheel! You can access a broad range of prevention resources from funding opportunities, guidance on a sticker shock campaign, or if you need a powerful prevention 101 webinar to present to the stakeholders of your local community. Coalitions 2.0 Presentation and Message Map developed in Central Wisconsin to review prevention with local, state, and federal policy makers and funding partners. Sticker Shock Campaign examples and recommendations for vendors. Members also shared checklists, youth permission slips, youth and retail follow-up surveys. Marijuana Dispensary presentation used to discourage towns from legislating retail marijuana dispensaries after legalization. RxSurvey results from Fayette County Georgia were shared for feedback and ideas for other coalitions who are developing similar surveys. In-Kind Volunteer Management spreadsheets including an in-kind sample, in-kind certification, and cash match certification was shared by CADCA’s Senior Coalition Development Manager, Jackie Rhodes. Over 140 discussions have taken place in the CADCA Community this past month. Please don’t be afraid to ask or answer a question. This is the way we connect as prevention professionals and come together for our mutual cause. Every question is important and helps CADCA reach a better understanding of hot topics and what CADCA members need the most help with in training. Take the advice of one of your colleagues and start a conversation. We often hear from members who want to reach out to other prevention leaders in their state or in different locations across the nation. Now you can! Search by city, state, or name in the directory and make new connections. You should also make sure to update your profile to make it easier for fellow members to learn more about you. You can easily do this by selecting the “Import from LinkedIn” button on your profile. You’re LinkedIn profile and picture will be imported directly to your profile page. The CADCA Community was created in response to member requests and its success will be because of CADCA members. CADCA members know that community prevention can’t happen on its own, but needs to happen within the larger context of a national conversation with resources being shared by everyone. CADCA is thrilled to be able to deliver a new member benefit that will help ensure the continued success of safe, healthy, drug-free communities across the globe. Please don’t hesitate to reach out to your membership team with questions about the CADCA Community. Amy can be reached at 703-706-0560 x228 or apica@cadca.org. Sign into the community.cadca.org and start connecting today!